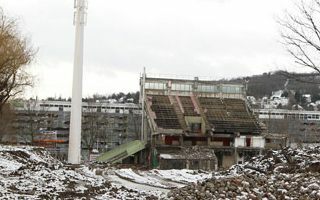 Today there are only two elements remaining from the old stadium. First one is the floodlight mast that will be left intact to commemorate the old stadium. Another is a small segment of the southern grandstand, which cannot be torn down at this moment. It holds the power transformer station and it has to operate until a new one is provided. This is planned for mid-February. But while there’s still debris in the south, in other parts of the site clearing and ground works were done already in 2014, allowing for foundation laying to begin. First concrete should be poured tomorrow, on Saturday. As general contractor Strabag confirms, works are well on schedule and delivery of the stadium in June 2016 is safe. Entire budget of the works is estimated at €53 million, largely manageable for SK Rapid thanks to municipal aid and the naming rights deal with Allianz. The Allianz Stadion (though criticized by many traditional fans) will hold 28,000 people.